Eoin Finn and Chelsey Korus are both world-renowned yoga teachers with a passion for the planet. In this special—and crucial—conversation, they discuss how the philosophy of yoga requires that yogis be environmentally-minded, and why it matters to them. Both Eoin and Chelsey will be teaching at several events this year. Click here for the full 2019 lineup and locations. A line in the Isha Upanishad translates to: His friends were shocked to find that despite the beauty of the cage the poor bird was dying. It can be interpreted as a cautionary verse, reflecting on the averse impact humans can have on the natural world. Wisdom of ancient spiritual texts are often transcendent of time and culture, and certainly the metaphor of a dying bird resonates with the pains we are experiencing in this modern moment. The planet is changing because of the human influence. With a rise in volatile weather patterns, changes in ecosystems, and dwindling landscapes that were once thriving, we can’t help but pose the question, what is a yogi to do? 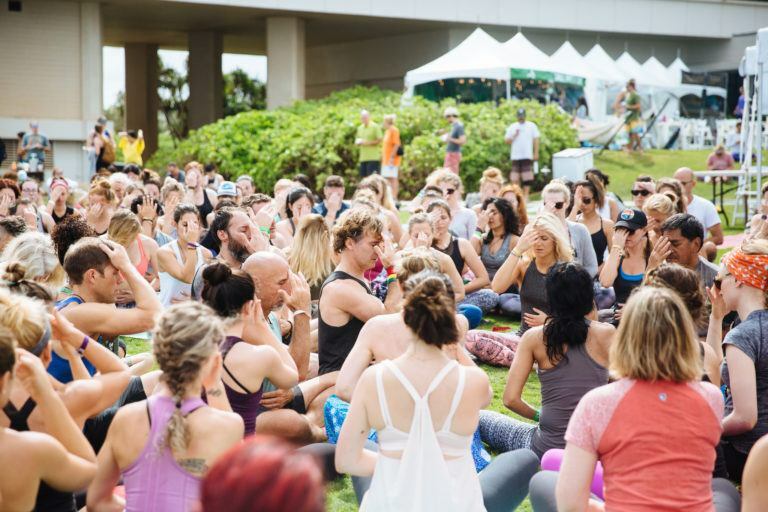 We turned to two outspoken natural world lovers, activists, and international yoga teachers, Chelsey Korus and Eoin Finn, to ask for their perspective on how we can individually and collectively support, protect, and revitalize the environment. How has your relationship with the environment informed your practice as well as your teaching? Chelsey: My teaching and my practice revolves around wonder. The word is on my vision board and I see it as a gift that is given to us by the earth. Nature gives us a common language and it is told through the voice of wonder. The more I am connected to the wonder of nature, the more I am inspired, and the more authentic I can be. When I am in that place of wonder and awe, I am completely present and therefore can speak to what is currently happening in and around me. The earth gives me a gift every time I connect with her, and it is from that gift that I teach. Eoin: I agree 100 percent with Chelsey. Wonder is one of the major purposes of being alive. We aren’t supposed to be on autopilot but work to open all of our senses. I am old enough to look back on my life and reflect on my years here and what has been guiding me. I realize that a big question I am answering is what actually happens to us [on every level] when we get quiet in nature. What happens to our bodies, minds, cells? That is the constant question, since I was 12, that I have been trying to answer. It’s a question that brings forth wonder and awe, and it takes place in nature. Why should we prioritize reconnecting with the environment? What are some ways we can develop a relationship with the natural world? Chelsey: We’re in an age of uncertainty. We are searching everywhere for happiness and ease. Yet, all we need to do is look to nature to get the wisdom we need to live clearer lives. The tree knows how to thrive, and the bird has been around far longer than we have. We can look to nature to get closer to what we want, what we need, and what we need to do. Yoga is a perfect practice to help us steep into the wisdom of the natural world. Yoga asks us to get quiet and wake up to the present moment. Find a daily sit spot. Go to the same place in nature and simply be a witness. Choose one time to be in nature and witness it. This is meditation: a witness to the now. We receive so much when we step into observation of everything the natural world has to show us and share with us. Eoin: I’ve noticed as I travel and teach, is that there is a thrust to be in a yoga studio and be able to do certain poses. I think we’re taking a wrong turn with where yoga is going. We’re not emphasizing deep connection with nature, and in my perspective, nature is an essential part of the yogic path. Even if you are on the 30th floor of a crowded city, we must become aware in our hearts that no matter what we are connected to nature. Every second breath we take comes from plankton in the ocean. The breath itself is a sacrament that connects us back to a harmonious relationship with the natural world. I would also say the source of real health is to be in connection with nature. Not to put your legs behind your head, but first and foremost, anchor into our innate bond with the natural world. What would you say to someone who feels despair about the state of the environment as they witness what’s happening on and to our planet? Chelsey: This is real. I cry everyday because I feel the Earth is hurting. But that’s a good thing. We want to choose to feel the connection to the environment. At the same time, when you’re out there in your world, the only thing you can do is be the hands and the feet of the change. Nothing else will give you the joy you will feel by cleaning up your immediate environment. Do one thing to support mother earth in a way you can. Pick up the trash you walk by in your community. It can be that simple. Here’s the way I look at it. Love what you love enough to take care of it even when you’re upset. Eoin: Side note: I am so stoked for what we’re going to do in Hawaii with Wanderlust! But the struggle is real. Just turn on the news to see the debate about whether climate change is real. It is easy to give up hope and crawl under a rock. However, what’s the purpose of my response? Do I want to be a part of the change? Let’s look at the third chakra, which is where this issue resides. When we get imbalanced and feel anger or sadness at the state of the world, we can harness the energy of the third chakra and channel it into compassionate action. What can we actually do to help the environment? Eoin: I think it’s a question we can all ask ourselves. I discovered that I wanted to help the ocean, especially the coral that is rapidly disappearing, and it’s essential to our ecosystem. I decided to host include coral reef restoration into my Blissology retreats. It’s called the EcoKarma Project, and what I’ve discovered is that the feeling you have when you are in action and in community, is so much more satiating then when we’re simply talking about the issue. Use what you’re feeling when you become connected to the environment as fuel for change. Ask, what can I impact as part of my yoga? Chelsey: What’s so great is that when you decide to get involved, how to get involved is going to present itself because you’ve put the idea into your awareness. Keep your eyes and ears open for people and organizations doing work for the environment and either send them a message and ask how you can get involve or give them a shout out on your social media feed to spread some light to your community on what they are doing. Eoin: In my opinion, the first step to saving the planet is the same step it takes to be a healthy conscious human being: falling in love with the natural world around us. Give yourself the gift of five minutes each day. Put away your smartphone and open up your heart-phone. Be with the beauty of nature and simply steep in it. Watch the above video for Eoin’s meditation to put away the smartphone. Chelsey: Also, we can only be in service of what we love. Growing up in Minnesota, I was scared of nature and the world around me, but I knew in my heart that there was deep healing to be had through a relationship with it. I began to treat the natural world like a relationship; I courted nature. I spent time with it, I got to know it in my own way. and overtime I fell in love with it. As Eoin said, start by falling in love with environment, and you’ll know what you need to do to support it. Anything else you feel inspired to offer on this topic? Eoin: For my urban yogis, if you can’t ind any nature to fall in love with, look up. The clouds and stars are always there. Nature is everywhere. Look up, pause, and be with the infinity of the sky. Let it light up your heart. Let’s become more obsessed with the stars in the sky than those in Hollywood. In summary, we are invited to open our eyes to the world around us. Steep in the wonder of what is right here. Fall in the love with this playground of a planet, and do what we can when we can to honor and protect her. As Chelsey so eloquently put it, “we must simply love what we love enough to show up and do our part.” With all of our individual efforts added together, the hope is that the beautiful cage will become much less important than the thriving of the miraculous bird inside of it. 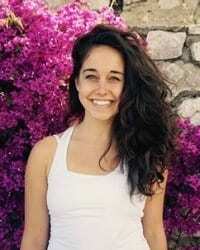 Erin Ward is a freelance writer, yoga teacher, and instructor at Wanderlust Hollywood.